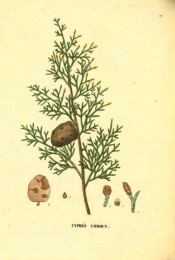 Fully-hardy, evergreen, narrowly upright, columnar, forming a very narrow, pencil-like tree, with fused and flattened branches, and spherical, prickly brown female cones, to 3.5cm long. To 40m. [RHSE, Hortus, Hilliers']. The Cypress of the ancients, widely grown in the Mediterranean region and probably an early introduction to Britain although the upright, columnar form is unknown in the wild. Horizantalis is the wild form. 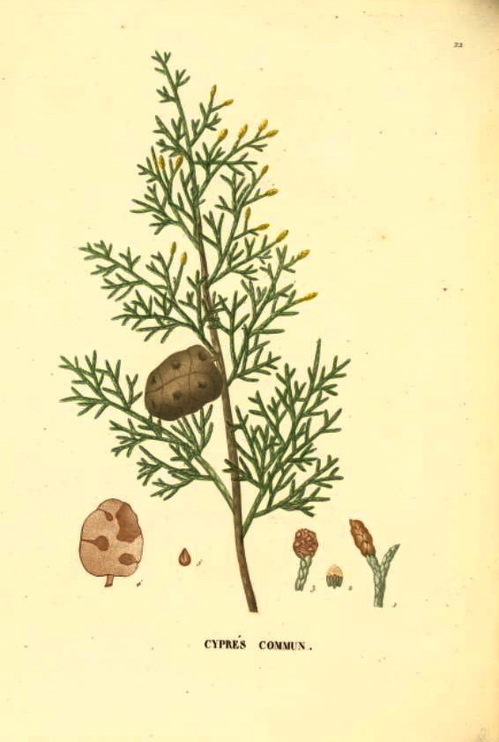 See also Cupressus sempervirens L. var. horizontalis Gord. Saint-Hilaire Arb. pl.22/1824. Listed in all published catalogues [C.27/1843].